“Each department manager turned toward internal efficiency because you told them to,” I repeated. Regina was stunned. She had difficulty seeing the root of the problem as her management directive. Regina’s look of surprise began to calm. Regina turned her head. “With an external focus?” she floated. 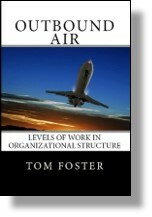 This entry was posted in Organization Structure and tagged internal focus, organizational structure, Outbound Air on June 17, 2015 by Tom Foster.